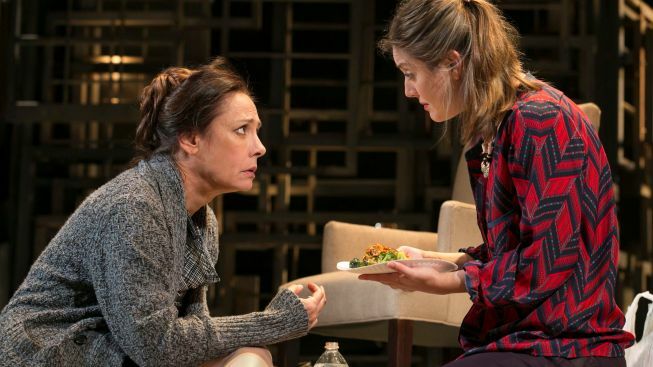 Review: Laurie Metcalf, Torn Between Here and "The Other Place"
Either one of two overwhelming events that impact Juliana Smithton in the course of “The Other Place" would be enough to render a strong woman unhinged. Taken together, they’re a rolling boulder of horror, gathering steam and threatening to crush the successful neurologist forcefully portrayed by Laurie Metcalf (TV’s “Roseanne,” and a founding member of the Steppenwolf Theatre Co.) in a production that just opened at the MTC’s Samuel J. Friedman Theatre. Except, of course, she’s not. A lot has already happened at the outset of Sharr White’s trim thriller, which had its world premiere in 2011 in a staging also directed by Joe Mantello (“Other Desert Cities,” “Wicked,” etc. ), and for which Metcalf nabbed an Obie Award. Those two forces acting on Juliana are her own health struggle, one that makes her a viable candidate for the same drug she’s now touting, and a mystery involving her daughter (Zoe Perry, Metcalf’s own child with first husband Jeff Perry), who we’re led to believe is estranged from her parents because of her relationship with their one-time assistant (John Schiappa, of “Assassins” and “Take Me Out,” who, like Metcalf, returns from the earlier production). Metcalf’s Juliana is two different women: the first, a businesslike medical researcher-turned-pharmaceutical rep; the second, a disintegrating mother distancing herself from reality. Juliana’s fear about her health manifests as anger and sarcasm, and is particularly potent in scenes like one where she bites the head off her doctor for not allowing her to smoke in her office ... which is inside a hospital. Anyone can get sick, but is it the truly brilliant people who have the most trouble when control over their bodies is wrenched away? Metcalf makes us feel her fear. Daniel Stern (TV's “The Wonder Years,” and the films “Diner,” “Home Alone” and “City Slickers”) is professorial and caring as Ian, Julia’s oncologist husband, who, almost inconsequentially, has filed for divorce, though we never for a moment believe he’ll leave her. Ian’s threat is a line-in-the-sand drawn to preserve his own balance while protecting the woman he long-ago promised to love and honor, even as she has become impossible to be around. David Zinn’s conservative costumes, all sensible shoes and silk blouses, afford Metcalf an aura of professionalism that make it easy to see her as a woman bettering her competition in a male-dominated field. The most prominent feature of the set, by Eugene Lee and Edward Pierce, is a jumbled matrix of grey windowsills that evoke the “Other Place” itself (at least, its physical manifestation) a family home on Cape Cod central to the plot. “The Other Place” satisfies and disturbs as it ties together the mystery involving Juliana’s daughter, and you’ll strain to wonder what goes through Metcalf’s mind, playing these particular moments opposite her own flesh-and-blood. Perry, in multiple roles, though billed only as “The Woman,” conveys familial estrangement as Juliana’s daughter, clinical resolve as the doctor Ian has cajoled into diagnosing her and, finally, as a shellshocked homeowner who must deal with a crisis in her living room. “The Other Place,” at the Manhattan Theatre Club’s Samuel J. Friedman Theatre, 261 W. 47th St., through Feb. 24. Tickets: $67-$120. Call 212-239-6200 or visit Telecharge.com.